Happy St. Patrick’s Day. St. Patrick is a great saint of the Church. It is not about green beer–which my favorite Irish deacon thinks is an abomination–and parades. “Patrick chose to reject “victim-hood” and self-centeredness. Instead, he embraced the way of the Cross, and learned the power of the Resurrection. That is why he was able to become a true disciple and carry on the redemptive mission of Jesus. He fell in love with the Lord by developing a profound and transforming interior life and a personal relationship with Jesus Christ which was nourished in the Sacramental life of the Church. Patrick cultivated a lifestyle of deep, constant and abiding prayer which bore the fruits of ongoing conversion. He learned to discern the voice of the Lord in his daily life, developed the eyes of faith and received the power of the Holy Spirit through which he was able to respond to the call to become a missionary in his age. Each of us is invited to do exactly the same in our age. The Risen Lord who changed Patrick’s life still calls men and women, just as he called Patrick, and invites them to a new life in and through His Son Jesus Christ. On this day, when the entire world pauses to remember Patrick´s life and his legacy, to rightly celebrate his full and meaningful life, and to honor to a beautiful country and people who have sent Christian missionaries to the rest of the world, let us truly honor his memory by choosing to walk as Christians in both word and deed. Like Patrick, let us choose to really follow Jesus Christ. Let us march into the Third Christian Millennium called as was this wonderful saint and hero, to proclaim, demonstrate and live the fullness of the Gospel, living in the heart of the Church for the sake of the world. Like Patrick we are called to become “fishers of men and women”. 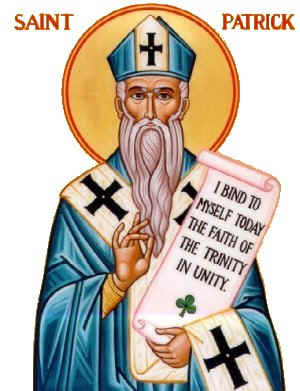 Read all about St. Patrick here. St. Patrick brought the Irish to the one true God. Ireland is in dire need of another St. Patrick. There is a beautiful prayer attributed to St. Patrick, St. Patrick’s Breast Plate. Here is a video of the prayer being recited. It has some lovely shots of Ireland. I will post the prayer following the video. This entry was posted in Saints and tagged Catholic, Irish Saints, St. Patrick. Bookmark the permalink.